Ever wondered what the real India is like? This travelogue contains. . .
—Hints and realities of traveling n India. —Memoirs of a spiritual quest. —Records of conversations with authentic sages. —Insights into its spirtual philosophy and traditions. Traveling off the beaten path, the author discovered India to be a vast and varied landscape of every reality imaginable and some that were unimaginable. This account is not only a trip behind the scenes; it’s an explanation of what is going on in this world of unique religious thought and cultural reality. Moving slowly through time on train, bus and ox cart, Nancy visited mountain villages, rural ashrams and hill stations—an India that tourists rarely see. Everywhere she traveled, she talked to the people, whether a saint or a camel herder. She took the time to investigate their ideas and customs. Her journey included Pondicherry, the home of the sage Aurobindo, Ramana Maharshi's ashram, Mahatma Gandhi’s ashram, and the famous temples at Chidambaram, Arunachala, B. R. Hills and Madurai. She enjoyed the wonderful forested mountains in the Nilgiris, B. R. Hills, Andhra Prasesh, Mt. Abu, India’s “Switzerland” in Rajasthan, as well as nature's waterways at the beaches of Pondy, Madras, Bimili Beach and the Kauveri River. She met many sages including Vimala Thakkar, Ram Sahdu, Swami Chinmayananda, Swamini Sharada Priyananda, Swami Nirmalananda, Father Bede Griffiths and Satya Sai Baba. The story is based on personal encounters giving facts and observations not available in previously published sources. Along the way, the author gives insight into philosophical thought and superstitious lore behind these descriptions, as the Indian culture is so inextricably bound with a belief system. Her goal is to demystify India for the Western world —and just maybe it will help the modern Indian realize what they had and what they are giving up when they imitate the modern American way of life. 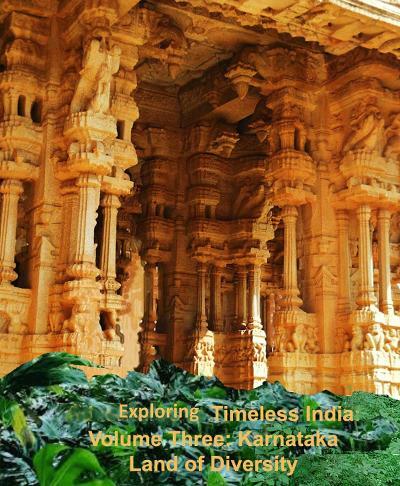 In this third volume of Exploring Timeless India, the author's explorations take the reader to one of India’s greenest states, Karnataka. From the mountains to the beaches, it’s a paradise for nature lovers, as well as a treasure trove for archeologists, historians, and pilgrims of every religion. She spends time in ashrams and her accounts give a picture of what in fact is, is not what she expected. The author gives insights into history, politics and lore of the various places she visits through research and conversations with sages and the many people who she meets along the way. She is always questioning to uncover new stories of India’s multifaceted reality. You will come to understand why the country that was visited by the Romans, Marco Polo and the target for Columbus became "that poor country." There’s something new in this volume, a travel guide with the “not to miss” highlights of the pilgrimage destinations, National Parks, and other special places. She must think you will be ready to pack for this adventure. 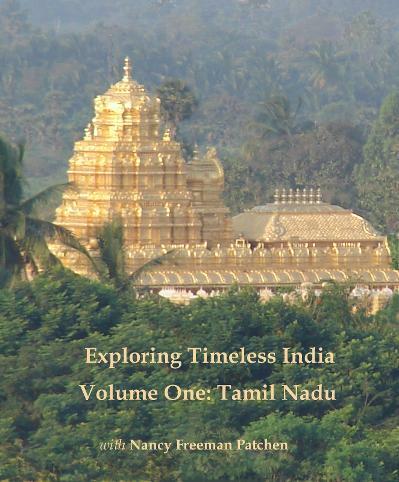 The first volume of Exploring Timeless India covers the southern most state of Tamil Nadu—in general, the most traditional state. It is a wonderful reality of beaches, mountain retreats, awesome temples, and it has an advantage that there are many English speakers here--even off the beaten path. Nancy's journey through Tamil Nadu included Pondicherry, the hometown of the sage Aurobindo, Sri Ramana Maharshi's ashram, the hermitage of an unknown sadhu living by a sacred river and ashram of Bede Griffiths. She visited the famous temples at Chidambaram, Arunachala, Rameshwaram and Madurai. She enjoyed the wonderful forested mountains in the Nilgiris, as well as nature's waterways at the beaches of Pondicherry, Rameshwaram, Madras, and the Kauveri River. Nancy's stories are based on personal encounters giving facts and observations not available in previously published sources. Along the way, the author gives insight into philosophical thought and superstitious lore behind the various adventures, as the Indian culture is so flexible and multifaceted. 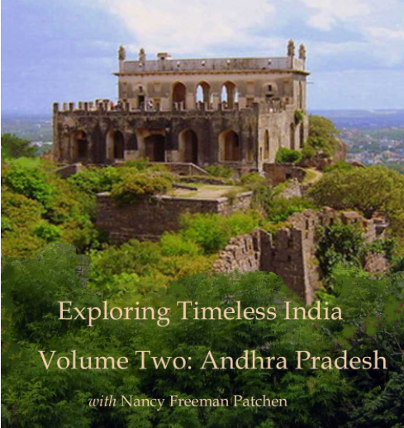 The second volume of Exploring Timeless India covers the diverse state of Andhra Pradesh. The encounters with people, places, history and women sages of Andhra gives insight into the reasons Moghuls, then the British commandeered India and just would not let it go. In this second volume, the author's explorations take her north to one of India’s largest and most diverse states, Andhra Pradesh. In a 1,000 mile circuit she discovers more diversity and realities than any equivalent space on the planet. She explores places of natural beauty, India’s biggest bird sanctuary, forested mountains, beaches, and finally is successful in encountering the sacred Godavari River. She meets with several women sages who have created unique environments for service to others. Her journey ends with a stay at the infamous Satya Sai Baba ashram. The author gives insights into philosophical thought, history, politics and lore through conversations with the many people who she meets along the way, uncovering new facets of India’s multifaceted reality. These e-books are available on Amazon.com. You can upload to computers, iPads, iPhones and Kindle--and if you have a Kindle you can read it free from the Kindle library.